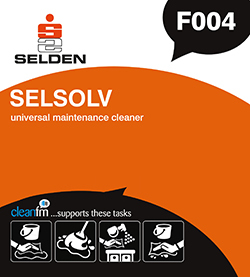 Selsolv instantly cuts through and solubilises grease and grime. Removes tobacco stains from paintwork and ceilings at a wipe. Removes traffic film and diesel stains from vehicles and buildings. Safe on most metals, rubber, ceramics, concrete, wood, glass and most plastics. Reduces labour costs, increases cleaning efficiency. For all public places where grease and grime discolour walls and surfaces e.g. railway/bus depots, waiting rooms, public houses, canteens, kitchens, hotels, cinemas etc. For walls, painted surfaces, renovating discoloured seats and synthetic coverings. Dilute Selsolv 1 part to 10 parts water for general maintenance cleaning, using spray or sponge application. For damp mopping dilute Selsolv 1 part to 40 parts water. N.B. Avoid spraying neat material. Ensure good ventilation.